Ever dabbled in the occult? You’ll have your chance Monday night March 10 when the waxing gibbous moon glides in front of the star Lambda Geminorum for much of North America, occulting it from view for an hour or more. Occultations of stars by the moon happens regularly but most go unnoticed by casual skywatchers. Lambda is an exception because it’s one of the brighter stars that happens to lie along the moon’s path. Shining at magnitude +3.6, any small telescope and even a pair of 10×50 or larger binoculars will show it disappear along the dark edge of the moon. With a telescope you can comfortably watch the star creep up to the moon’s edge and better anticipate the moment of its disappearance. The fun starts a few minutes before the impending black out when the moon, speeding along its orbit at some 2,280 mph (3,700 km/hr), draws very close to the star. During the final minute, Lambda may seem to hover forever at the moon’s invisible dark limb, and then – PFFFT – it’s gone! Whether you’re looking through telescope or binoculars, the star will blink out with surprising suddenness because the moon lacks an atmosphere. If there was air up there, Lambda would gradually dim and disappear. Even without special instruments, early astronomers could be certain the moon had little if anything to protect it from the vacuum of space by observing occultations. As the moon moves approximately its own diameter in an hour, you can watch Lambda re-emerge along the bright limb roughly an hour later, though its return will lack the drama and contrast of a dark limb disappearance. While occultations allow us to see how swiftly the moon moves in real time as well as provide information on its atmosphere or lack thereof, real science can be done, too. Observers along the occultation boundary in the southern U.S. can watch the star pop in and out of view as it’s alternately covered and uncovered by lunar peaks jutting from the moon’s limb. Before spacecraft thoroughly mapped the moon, careful timings made during these “grazing occultations” helped astronomers refine the profile of the moon’s limb as well as determine elevations of peaks and crater walls in polar regions. They can still be useful for refining a star’s position and motion in the sky. The moon’s limb can also be used much like a doctor’s scalpel to split unsuspected double stars that otherwise can’t be resolved by direct observations. Take Lambda Gem for instance. We’ve known for a long time that it totes around a magnitude +10.7 companion star 10 arc seconds to its north-northeast, but previous occultations of the star have revealed an additional companion only a few hundredths of an arc second away orbiting the bright Lambda primary. The star plays a game of hide-and-seek, visible during some occultations but not others. Estimated by some as one magnitude fainter than Lambda, keep an eye out for it Monday night in the instant after Lambda goes into hiding. I watched just such a “two-step” disappearance of Antares and it fainter companion some years back. With brilliant Antares briefly out of view behind the moon’s limb, I easily spotted its magnitude +5.4 companion just 2.5 arc seconds away – an otherwise very difficult feat at my northern latitude. Want to know more about things that disappear (and reappear) in the night? Make a visit to the International Occultation Timing Association’s website where you’ll find lists of upcoming events, software and how to contribute your observations. If you’re game for Monday night’s occultation, click HERE for a list of cities and times. Remember that the time show is Universal or Greenwich Time. Subtract 4 hours for Eastern Daylight, 5 for Central, 6 for Mountain and 7 for Pacific. Wishing you clear skies as always! Did you notice a bright “star” close to the Moon last night (September 8, 2013)? People around the world had the treat of seeing the waxing crescent Moon have the planet Venus snuggle up close… or in some places, the Moon actually passed in front of Venus, in what is known as an occultation. Also, on Saturday, the bright star Spica added to the scene. Thanks to our readers from around the world for sharing their images and videos! over the Eternal Flame of the 9/11 Memorial located here in San Antonio, Texas. Credit and copyright: Adrian New. The Moon and Venus on September 8, 2013. Credit and copyright: Wes Schulstad. The waxing crescent Moon near Venus on the evening of Sunday, September 8, 2013, as seen from southern Alberta, Canada. Credit and copyright: Alan Dyer/Amazing Sky Photography. Here’s a video showing the occultation of Venus by the Moon, photographed by Fabian Gonzalez. 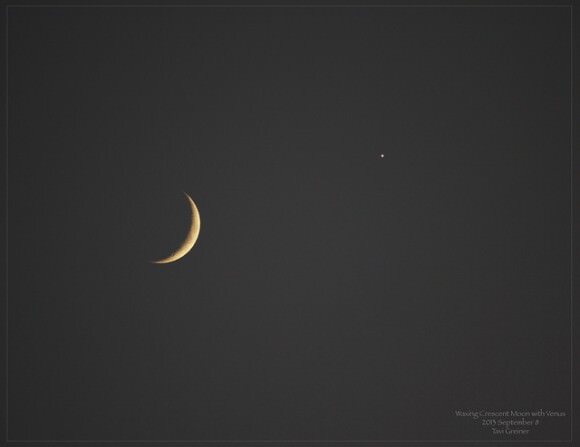 The 12% waxing crescenet Moon and Venus on September 8, 2013 as seen from Shot in Kennesaw, Georgia. Credit and copyright: Stephen Rahn. The new Moon with Venus on its right. Taken from the dark sky preserve at the Nutwood Observatory in central Ontario, Cananda. Credit and copyright: Brian McGaffney. A close-up of September’s waxing crescent Moon with Venus on September 8, 2013. Credit and copyright: Tavi Greiner. A calm and peaceful moment on a beautiful beach, with a planetary alignment between planets, Saturn (in the top left corner), Venus and Spica star (in the center image), and the crescent Moon above the horizon, as seen on September 7, 2013. Credit and copyright: Miguel Claro. Conjunction of Saturn, Venus, and the 2.5 day old Moon on Saturday, September 7, 2013. Spica sneaks into the photo beneath Venus. Taken from Salem, Missouri. Credit and copyright: Joe Shuster, Lake County Astronomical Society. Video of the occultation of Spica by the Moon on September 7, 2013 from Israel, taken by Gadi Eidelheit. Read more about at his website, VenusTransit. Beautiful Moon & Venus as seen from Mumbai on 8th September 2013. Credit and copyright: Henna Khan. The crescent Moon and Venus as seen from central Illinois. Credit: Nancy Atkinson. Such a quip may be deemed appropriate as we endured the media onslaught this past weekend for the third and final perigee Full Moon of 2013.